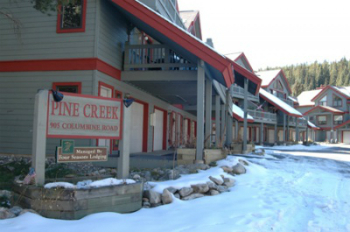 Pi ne Creek Townhomes for sale back onto the Blue River and are just across it from the base of Peak 9 of the Breckenridge Ski Resort. They are located in a quiet corner on the outside of the Columbine loop. This puts them in the loop when it comes to use of the Columbine neighborhood pool with hot tubs and heated pool. This loop is a winter lodging mecca, but Pine Creek’s location on the river, gives it a little more peace and quiet. The free town shuttle stops on Columbine and connects any town home for sale in Pine Creek with the rec center, the town supermarket and other shops on the north side of Breckenridge, that may be just a few too many block to walk. Southside shops and restaurants begin over the river in the Village at Breck or Main Street Station, which is directly north of the loop. Find out more about the spacious townhomes in Breckenridge or start browsing the Pine Creek Townhouse listings below to find that perfect home! Pine Creek Townhomes are centered around a parking area off a short private drive, and have a one-car garage access from this parking area. They were built in the nineteen-nineties and were designed to mimic the simple, mining-era Victorian style found in the historic district. The exterior is wood, and the layout classic. Snow-covered trails are maintained between Pine Creek Townhomes and the base of Peak 9 in the winter, and in summer there’s a footbridge across the open space maintained by the Columbine neighborhood, so it’s easy to get to the national forest, or ski lifts. In addition to the water sports available at the neighborhood pool, Pine Creek homeowners have fishing rights on the nearby Blue River. Size: 1672 to 2605 sq. ft. Located in the Columbine Loop in Warriors Mark, across the Blue River from the base of Peak 9. Drive south on Main Street to last stoplight at Boreas Pass Road, turn right on Broken Lance Drive. At the three-way stop make a left and remain on Broken Lance, take the next right onto Columbine, and the entrance to Pine Creek will be on the left. These townhomes are between Tamarisk and Tannebaum on the River. Contact us online or give us a call at (970) 453-2200 to recieve free information on the Breckenridge real estate market.